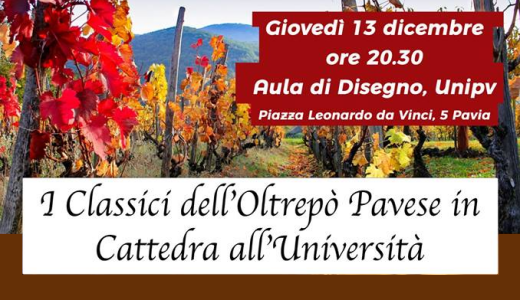 Six Oltrepò Pavese wineries (La Piotta, Martilde, Monsupello, Montelio, Picchioni, Pietro Torti) will present their top wines at the University of Pavia (Drawing Hall) on Thursday, December 13th at 08:30 pm. The tasting, led by oenologist Beppe Zatti, has been organised for charity purposes. FISAR Pavia will provide the service for free. All collected donations will be given to the research project „Organs in box: a cure for us, a life for him“. The minimum donation is euro 25,00.